Texas Shetland Sheepdog Rescue View other Shetland Sheepdogs for adoption. My name is JoJo. I'm a sheltie mix girl of about ten years old. I started out at the Houston SPCA, where my previous mom adopted me from so I had my own home for a little while. But then she couldn't take care of me anymore so I came to Texas Collie and Sheltie Rescue to find a new family. I'm sure you would like to know more about me. So let me give you the scoop! First thing in the morning, before I have my breakfast I like to go roll around in the yard. Then come in for a little chow. Normally I'm on the quiet side unless I need to go potty, then I will for sure let you know it's time to go take care of business. I like to take naps. I also like ear and back scratches. I promise we will be great friends! So don't wait too long to fill out an application. I'm so cute I'll be gone in no time! JoJo We don't know a whole lot about little JoJo except that she initially came from the Houston SPCA. Her previous owner had her about five months and was losing her home so she couldn't take care of JoJo anymore and gave us a call. We have had her completely vetted. She is heartworm negative and ready to find a new family and forever home. 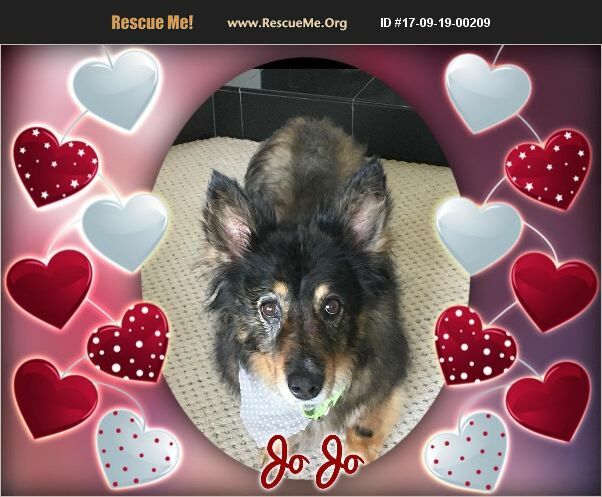 If you are looking for a low-key companion JoJo would be the one for you since she is on the quiet side. Please go to our website www.texascollierescue.org and fill out an application.